Sina Weibo is China’s most important social media website, with hundreds of millions of users sharing posts about everything ranging from their favorite pop stars to what they just ate. However, it can also be used to circulate political news and commentary critical of the government, a feature authorities try to restrict in a number of ways, including by blocking the words that people can search for. The inability to search for certain words can be static. For instance, Radio Free Asia (自由亚洲电台) and Falun Gong (法轮功) have been blocked consistently on the site since 2011. However, sometimes words can get unblocked and/or re-blocked, which is a potential indication of shifting political winds or simply housecleaning on the part of the censors who may remove previously-filtered keywords from the list once they are deemed no longer sensitive. 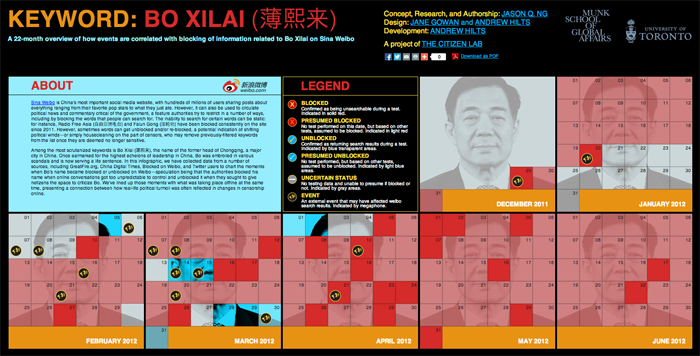 Among the most scrutinized keywords is Bo Xilai , the name of the former head of Chongqing, a major city in China. Once earmarked for the highest echelons of leadership in the country, Bo was embroiled in various scandals and is now serving a life sentence. In the infographic linked to below, we have collected data from a number of sources, including GreatFire.org, China Digital Times, Blocked on Weibo, and Twitter users to chart the moments when Bo’s name became blocked or unblocked on Weibo. The speculation is that the authorities blocked his name when online conversations got too unpredictable to control and unblocked it when they sought to give netizens the space to criticize Bo. We have lined up those moments with what was taking place offline at the same time, presenting a connection between how real-life political turmoil was often reflected in changes in censorship online. Click the image below to launch the interactive infographic.